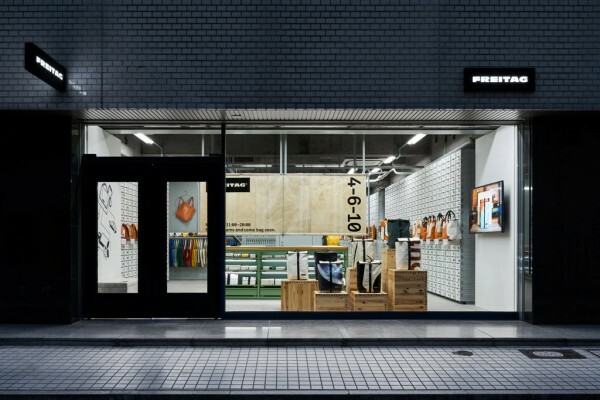 We designed an interior for FREITAG store in Osaka, after Ginza and Shibuya location. 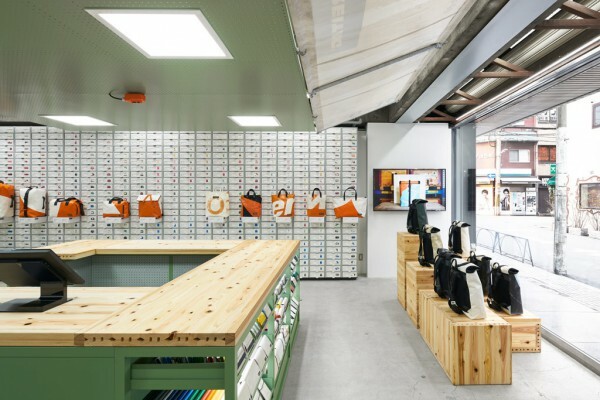 They sell colorful messenger bags and accessories made out of recycled truck tarpaulins", bicycle inner tubes, and used car seat belts. And it is their 25th anniversary this year. The store location faces the street front. 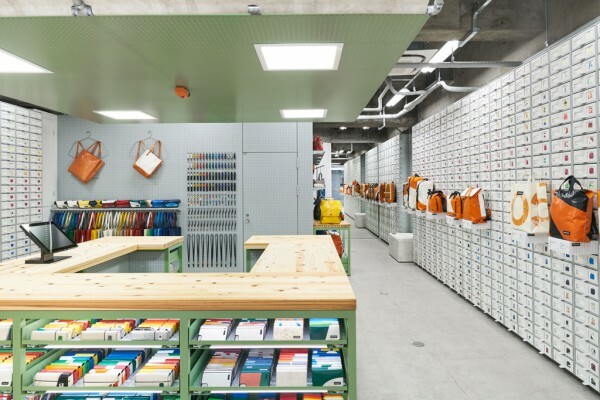 We were asked to design the interior maximizing the 65m2 space to store 1200 one-of-a-kind bags. 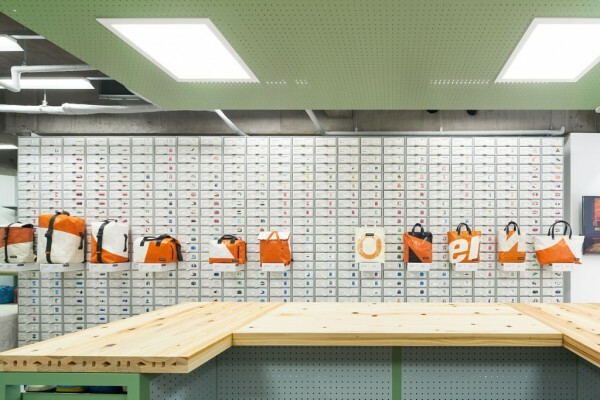 Based on “kiosk” style inspiration, which densely displays products in limited space, we planed to locate u-shaped counter at the center of the store. 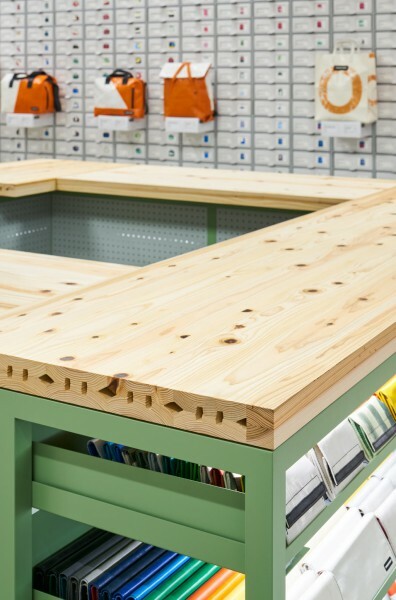 This counter is composed of steel cabinet and cedar wood top recycled from thinned woods. 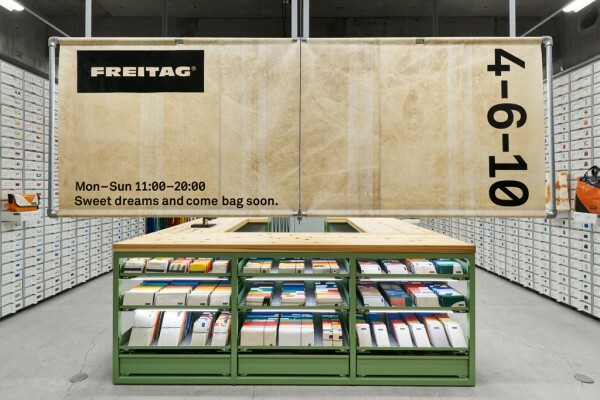 Above the counter, we hang a screen made of the same truck tarpaulins used for FREITAG’s bag. 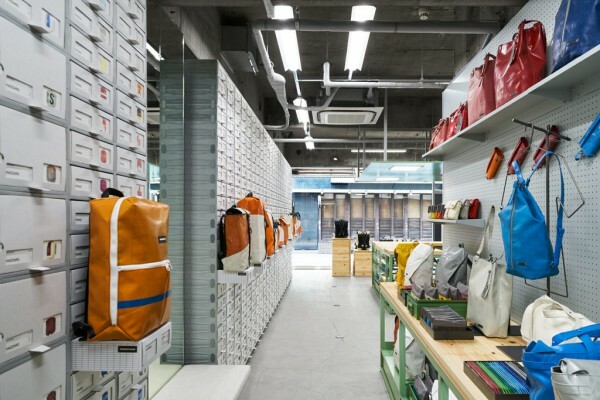 When the store opens, the screen is opened like kiosk’s awning. 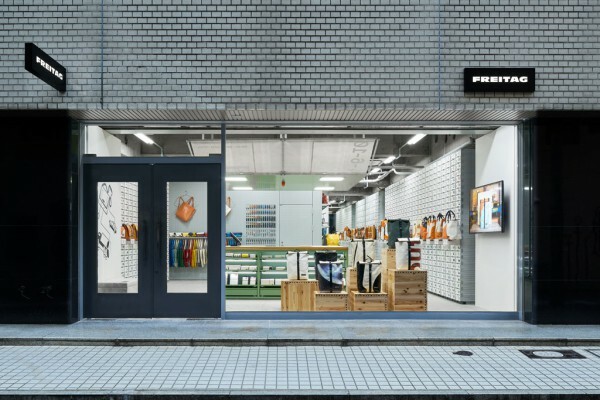 When the store is closed, the screen is closed showing printed FREITAG’s logo to the outside of the store. 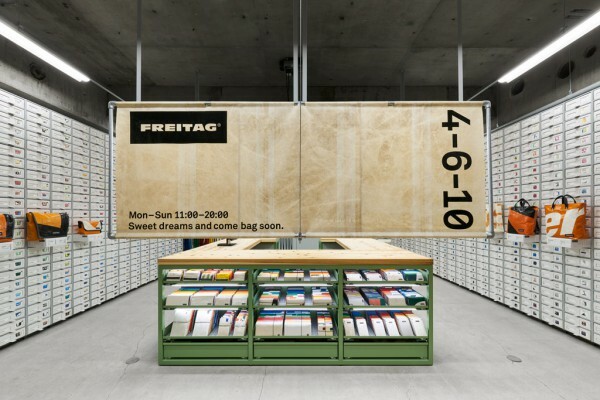 On the left and right side of the walls, we used full height for locating V30 which is FREITAG’s original shelf. On the rear wall of the store, we put perforated steel panels to enable the elevation for various visual display. 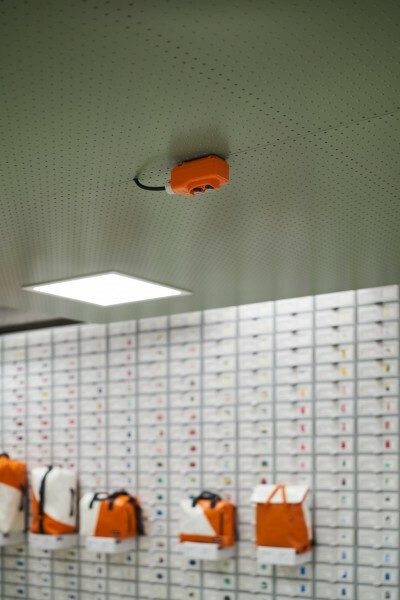 For the ceiling, after cleaning the existing concrete surface, we hang factory lighting. For the floor, we have just polished the existing concrete floor. 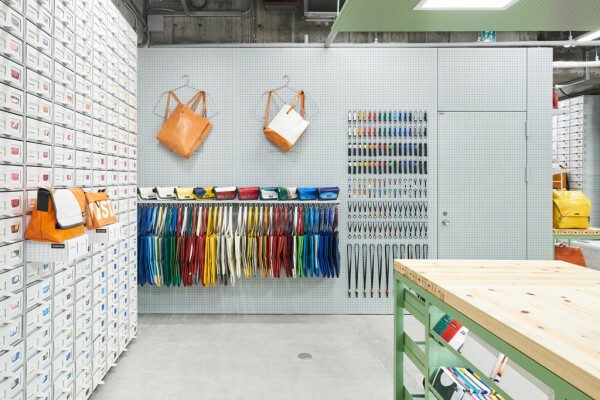 This kind of treatment for the existing surface we did in Ginza and Shibuya. 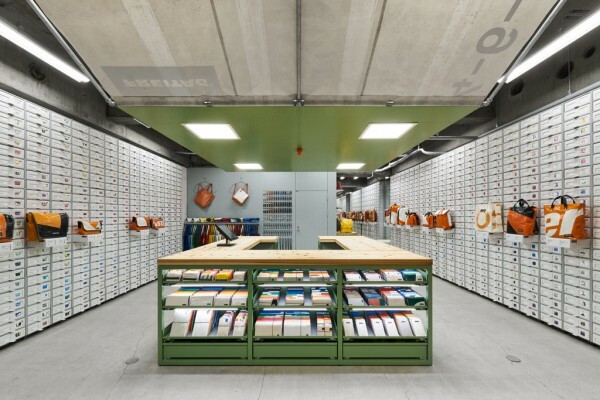 We think it provides not only industrial atmosphere, but also the contrast with the new furniture. We attempted to refresh the store by using a new theme,“KIOSK”.